January marks the bottom of the mean temperature curve for the year. 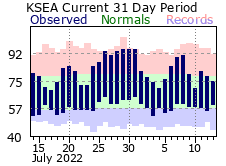 Note how the green band denoting the mean high and low temperatures begins to creep up at the end of the month. Still cold, but there's hope. Biking to work this morning helped make this clear. There were a few more birds, there are a few buds swelling on the trees, the oddball snowbank was that much smaller… Here’s to new things arising from the fertile soils made rich this fall and during winter’s sleep. Here’s to a beautiful life that we will remember formally this weekend even though she’s with us everyday. Here’s to the sunshine streaming through our windows.